For the band, see The 31st of February. In this respect, these "dates" are similar to other clearly fictional data used for a similar purpose, such as the 12th of Never or "John Q. Public". 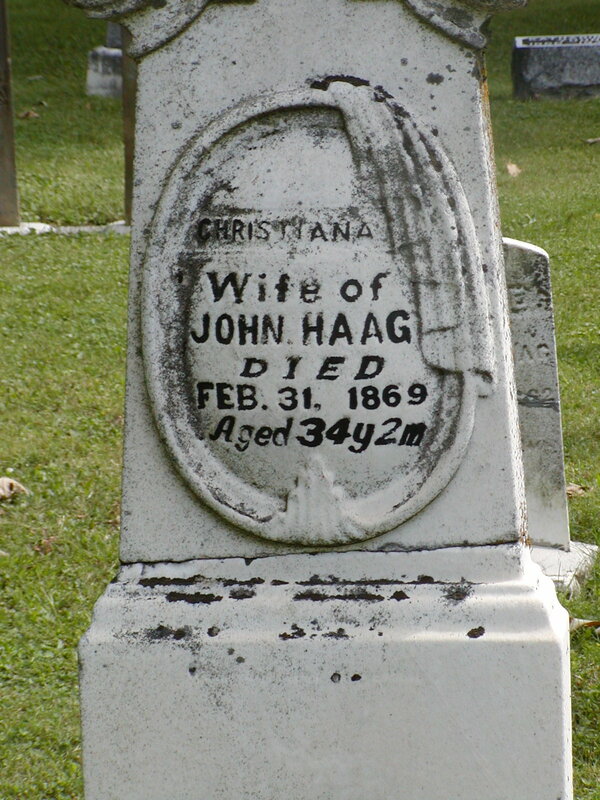 This gravestone in the Old Mission Church Cemetery in Upper Sandusky, Ohio, shows the date of death for Christiana Haag as February 31, 1869. "[T]he world's first February 31 Party! ... When: On February 31, of course! The festivities will start at 12:61 PM..." (usage as nonsense data in a domain name placeholder page). An episode of The Alfred Hitchcock Hour based on the novel of the same name by Julian Symons is entitled "The Thirty-First of February". David Wayne stars as a man who, under suspicion of murdering his wife, is intentionally being driven insane to make him confess. The process includes changing his desk calendar back repeatedly to February 4, the date of her death, and eventually changing it to the nonexistent February 31. "sample web page / Page Title / Last Updated February 31, 1999" (usage as example data in instructional materials). Ripley's Believe It or Not! states that William O'Malley, "according to his birth certificate on file in Clifden, Ireland, was born in 1853 on February 31". ^ a b "You are invited...". Feb31.com. http://feb31.com. Retrieved 2010-02-27. ^ "Gravestones in the Churchyard of St. Peter-in-the-East". http://www.seh.ox.ac.uk/about-college/gravestone-transcriptions. Retrieved 30 September 2013. ^ "The Thirty First of February". tv.com. http://www.tv.com/the-alfred-hitchcock-hour/the-thirty-first-of-february/episode/135466/summary.html?tag=ep_list;ep_title;14. Retrieved 2009-08-30. ^ Maricopa Center for Learning and Instruction (2002). "Lesson 12: Address Footers and E-Mail Links". Writing HTML: A Tutorial for Creating Web Pages. Maricopa Community Colleges. http://www.mcli.dist.maricopa.edu/tut/tut12.html. Retrieved 2007-07-06. ^ Ripley Enterprises, Inc. (September 1969). Ripley's Believe It or Not! 15th Series. New York City: Pocket Books. p. 25. ISBN 0-671-80473-1. This page uses content from the English language Wikipedia. The original content was at February 31. The list of authors can be seen in the page history. As with this Familypedia wiki, the content of Wikipedia is available under the Creative Commons License.